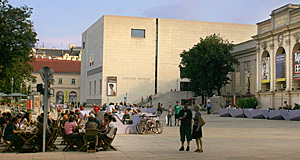 In 2001, the previously private art collection of Rudolf and Elisabeth Leopold was moved into the MuseumsQuartier and opened to the public in the new Leopold Museum. It was the last part of Vienna′s new art district to be opened and within a very short amount of time, became the most popular one. The collection gives a wide overview on classic modernism in Austria with a strong emphasis on Austrian expressionism. It is best-known for the biggest collection of works by Egon Schiele, which form the core of the collection. The museum also holds a large collection of works by Gustav Klimt, who played a crucially influential role in the establishment of an academic tradition in modern fine arts around 1900. At this time he and other artists of the Secession movement cancelled their membership with the Künstlerhaus and parted from the predominantly conservative (historicist, realist) school of academic painting. Beyond that, the museum also has a large collection of paintings, graphic art and objects/crafts from throughout the 19th and 20th century that can serve as a basis for demonstrating artistic developments in Austria mostly between 1850 and 1950. This includes pieces from Viennese Jugendstil, the Wiener Werkstätte (Vienna Workshop) and other eras. The represented artists of the Leopold Museum include such prominent figures as the "trio" of Gustav Klimt, Egon Schiele and Oskar Kokoschka; Albin Egger-Lienz; Anton Kolig; Alfred Kubin; Kolo Moser; Richard Gersl; Herbert Boeckl; Anton Faistauer; Ferdinand Georg Waldmüller; Anton Romanko; Josef Hoffmann; and Robert Hammerstiel. To me, the Leopold Museum has one of the most sensitively arranged exhibitions in Vienna and is among my favourite museums. Just after moving to Vienna, it was the first museum I went to and found it a great introduction (or in my case "re-introduction") to Austria and its cultural heritage in fine arts. There is no claim of completeness anywhere in the museum, but a spirit of deep understanding for art and a very personal touch given by Rudolf Leopold. Leopold was born in 1925 in Vienna, where he grew up and studied medicine. During his studies, he started to attend lectures on the history of art and by the time he graduated with his MD, he had already begun to collect actively himself. Most of his dedication was paid to Egon Schiele, an artist fairly unknown at this time and not particularly popular with other collectors. It was through Rudolf Leopold that the World re-discovered Schiele: After an exhibition on modern classic art from Austria in the Netherlands, at which Leopold had served as the main exhibitor, Schiele started to become acknowledged as one of Europe′s most outstanding artists. From then on, Leopold helped to organise Schiele exhibitions frequently all over the World and consistently added to the recognition as well as academic understanding of Schiele. Here he proved that he was more than a passionate collector, but also a great art historian. As such, Leopold published a monograph on Egon Schiele in 1972, which is still considered to be the most complete reflection on Schiele′s life and heritage. In 1994, Rudolf Leopold, the Austrian National Bank and the Republic of Austria created a foundation that received more than 5,000 pieces of art from Leopold′s collection. The foundations goal was the creation of a museum to present this collection and the artistic movements of classic modernism in Austria. After some fundraising endeavours, the construction of the new museum started in the MuseumsQuartier and the Leopold Museum was opened a few years later in 2001.